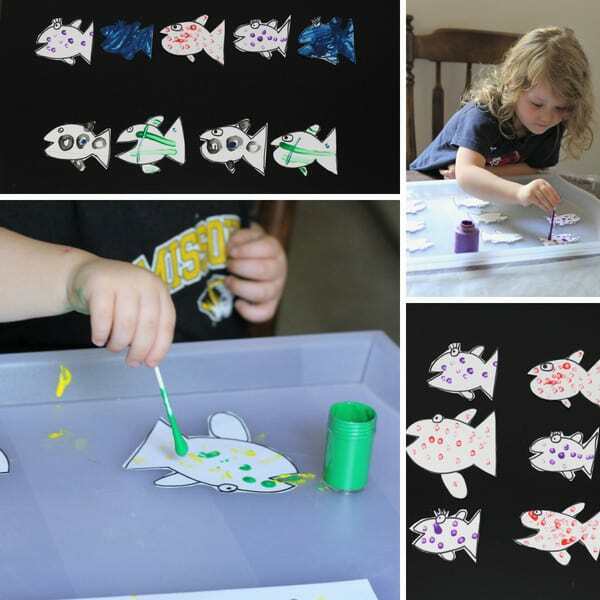 It’s Ocean week and today’s Storybook Summer idea is a simple fish pattern making activity inspired by Hooray for Fish by Lucy Cousins. 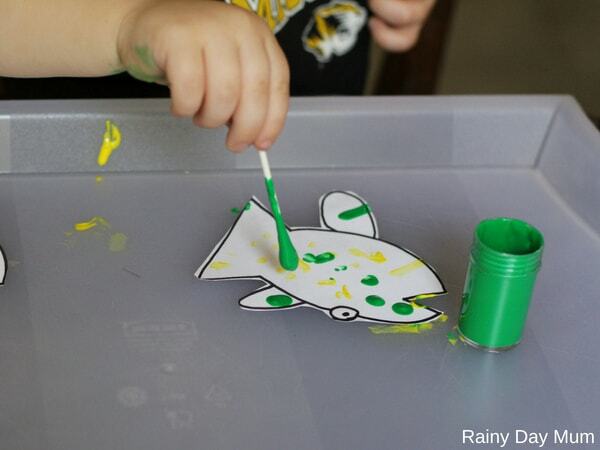 Paint colorful fish and then use them to create patterns. 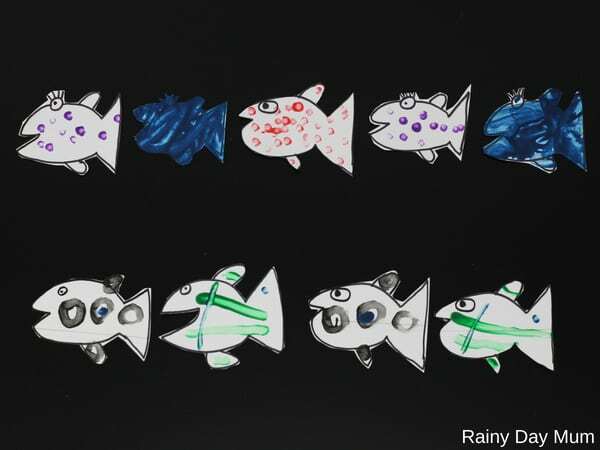 You can use the fish to work on other math skills in addition to making patterns – like sequencing, sorting, counting, and more. We have included links to products and resources we recommend for this activity. If you purchase via these links we may earn a small commission. Hooray for Fish by Lucy Cousins is full of colorful fish of all different shapes and sizes. Follow a little fish through the rhyming text to meet all of her fishy friends. 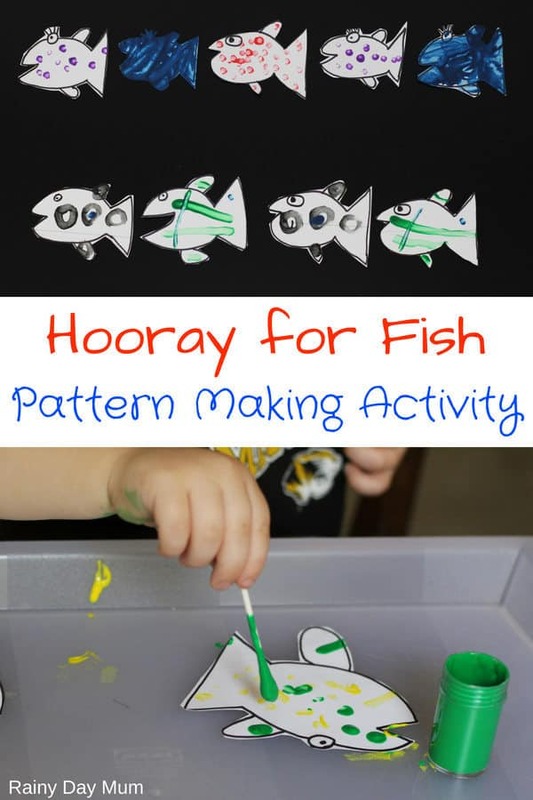 The patterns and colors on the fish were my inspiration for the pattern making activity. I started by drawing some fish on white cardstock. I made a few copies so we had fish that looked similar. My 8 year old helped cut out all of the fish. Then all 3 of my kids set out painting. I had them paint fish with the same patterns and colors. 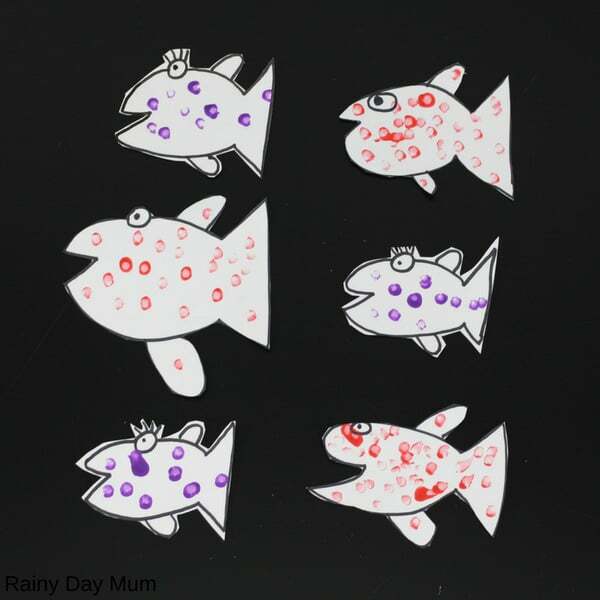 4 year old, Lily, chose to give some fish purple polka dots. Other fish got red dots. She painted the rest of her fish blue. Two-year-old, Elon, chose yellow and green for his fish. We used cotton swaps to help make the dots easier. You could also use paint brushes. I recommend washable paints. Someone always ends up getting paint somewhere it shouldn’t be. Aiden chose a combination of stripes and dots for his fish. He made sure they looked as identical as possible. Once the fish are dry, it’s time for the pattern making part. 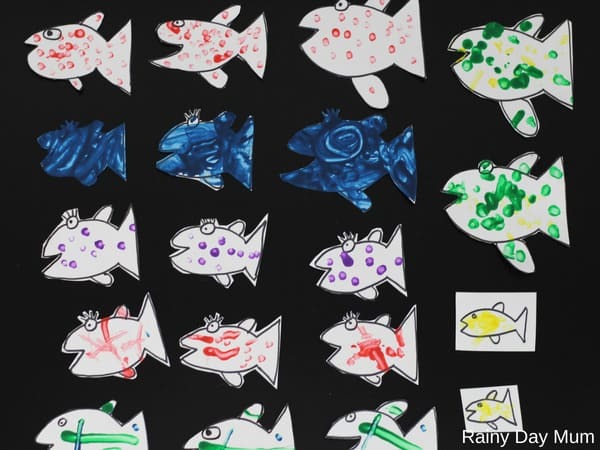 Choose two or three different fish and ask your child to make a pattern. Show her an example. Start with a simple ABAB pattern: black fish, green fish, black fish, what comes next? Or try an ABCABC pattern: purple fish, blue fish, red fish, purple fish, blue fish, what’s next? In addition to patterns, you could work on counting or colors. How many red fish are there? Or practice sorting the fish into groups. Can you find all of the fish with eye lashes? Place all of the little fish in this pile and the big fish in that pile. 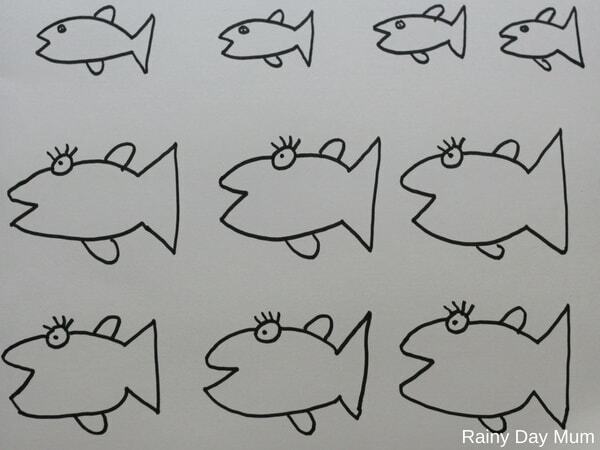 Sort the fish with polka dots in one group and the fish with stripes in another group. Try this watercolor ocean art project inspired by Oliver Jeffer’s We Are Here. 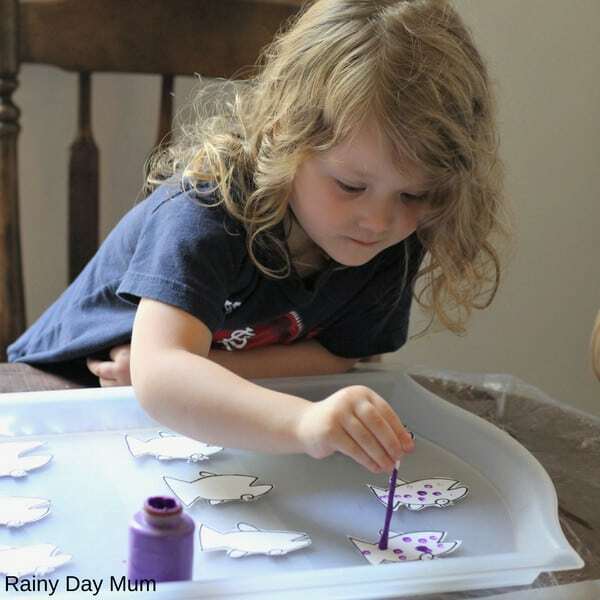 It’s process-driven art that’s easy for all ages. Practice sorting ocean animals after reading I’m the Biggest Thing in the Ocean. After reading How to Survive as a Shark, download a free Shark Find and Color printable.